How to Easily Master Format SAMSUNG GALAXY Y GT-S6310 & DUOS S6312 (YOUNG) with Safety Hard Reset? Tips to solve the problem at SAMSUNG GALAXY Y GT-S6310 & DUOS S6312 (YOUNG). Samsung give new option for anyone who enjoy using Samsung Galaxy Young series, the new one is call SAMSUNG GALAXY Y (YOUNG) GT-S6310 & S6312. The different between S6310 vs S6312 is about the simcard slot. The S6310 have single simcard slot while S6312 have dual simcard slot. For internet connection the Duos S6312, the 3G HSDPA internet data connection only available at the first slot, the other slot only work for 2G data connection. Fix and Problem Solving for Recovery SAMSUNG GALAXY Y GT-S6310 & DUOS S6312 (YOUNG) hang or not responding or malfunctions or stuck or freezing or bricked ? The new generation of Galaxy Young already have more power processor and internal memory to run applications which download from Google Play Store. There are many applications at Google Play Store but some of them is not compatible with SAMSUNG GALAXY Y GT-S6310 & DUOS S6312 (YOUNG). The problem going to happen if you download that incompatible one, or maybe the first time downlaod everything work fine, but after you change some setting, then the SAMSUNG GALAXY Y GT-S6310 & DUOS S6312 (YOUNG) start act not normal such as hang or stuck or frozen or bricks or the LCD touch screen is not responding while touch or navigate. First step that you can try is doing soft reset or restart the SAMSUNG GALAXY Y GT-S6310 & DUOS S6312 (YOUNG), if the problem still happen then you have to do hard reset. 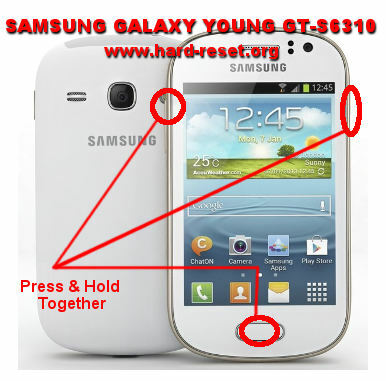 How to Soft Reset or Reboot or Restart SAMSUNG GALAXY Y GT-S6310 & DUOS S6312 (YOUNG) ? If you want to soft reset SAMSUNG GALAXY Y GT-S6310 & DUOS S6312 (YOUNG), try to remove the battery and then put again to the place then turn on the SAMSUNG GALAXY Y GT-S6310 & DUOS S6312 (YOUNG) to do reboot or soft reset. If you do not want to open the battery, you can do easily with pressing Power Button for several seconds and the option menu to turn off or reboot will appear. SAMSUNG GALAXY Y GT-S6310 & DUOS S6312 (YOUNG) will do the process to Master Reset to Factory Default, wait for several minutes. The SAMSUNG GALAXY Y GT-S6310 & DUOS S6312 (YOUNG) will doing the process of restoring to factory default. How to Restore and Reinstall Clean Android Operating system / firmware at SAMSUNG GALAXY Y GT-S6310 & DUOS S6312 (YOUNG) ? The source of Android Jelly Bean operating system already saved at SAMSUNG GALAXY Y GT-S6310 & DUOS S6312 (YOUNG) internal rom, so we do not need to copy from outside phone to reinstall the operating system. Doing the simple step of hard reset or master format will automatically reinstall the clean and factory default Android Jelly Bean operating system at SAMSUNG GALAXY Y GT-S6310 & DUOS S6312 (YOUNG). How to Unlock or Fix or Bypass or Solutions for SAMSUNG GALAXY Y GT-S6310 & DUOS S6312 (YOUNG) forgot password code or security lock screen pattern or pin? We can have several option to protect SAMSUNG GALAXY Y GT-S6310 & DUOS S6312 (YOUNG), we recommended using security password pin or screen lock pattern to make it more secure. If in some conditions you forgot about the answer of security password pin or screen lock pattern protection, then you can try to press the Forget Password / Pattern button. That button is not always appear, to show it, you need to do several time wrong password, after that the button will be appear. After pressing the Forget Password / Pattern button, you will ask for Google account username and password that you ever save in the first time activate the SAMSUNG GALAXY Y GT-S6310 & DUOS S6312 (YOUNG). If you also can not access the Google account, then you have to do hard reset or master format with option number 2 above. How to Improve Performance SAMSUNG GALAXY Y GT-S6310 & DUOS S6312 (YOUNG) to make run more faster? After using several month, some user asking about why their SAMSUNG GALAXY Y GT-S6310 & DUOS S6312 (YOUNG) become slowly. Usually this problem happen because there are a lot of applications installed and some of them work as background process. The background process application such as chat or game or something like that will eat some processor resource and could make the phone become slowly. To make it work faster again, you need to reduce the installed applications. If the problem still happen, then you have to do hard reset or master format to make it work normal again. Is That Any Secret Code for Doing Format SAMSUNG GALAXY Y GT-S6310 & DUOS S6312 (YOUNG)? The secret code for doing hard reset SAMSUNG GALAXY Y GT-S6310 & DUOS S6312 (YOUNG) is *2767*3855#. But please remember to always becareful typing that code, because the SAMSUNG GALAXY Y GT-S6310 & DUOS S6312 (YOUNG) will doing hard reset and remove all data and installed applications. How to Make SAMSUNG GALAXY Y GT-S6310 & DUOS S6312 Battery Work Longer or Not Fast to Drain (Extended Battery Life)? Make sure the battery is not out of date, usually the battery will work normally if about than 2 years, but some users have more experience for battery life. However, we can try to make SAMSUNG GALAXY Y GT-S6310 & DUOS S6312 not fast to drain by turning off not use connection like Wifi or Bluetooth or GPS. The brightness of LCD should be not too bright. Some uses turn off the automatic brightness, because it can make the SAMSUNG GALAXY Y GT-S6310 & DUOS S6312 fast too empty when we use at outdoor then the LCD will automatically turn to very bright. We also need to know that using 3G HSDPA for Internet data connection can make the battery empty faster as well, if we need to make battery life more longer, then turn off the 3G, only use 2G but of course the Internet data connection will be more slowly. [Q] when i press the power button the screen hangs up to the logo samsung galaxy young GT-6312. I am unable to do soft reset or hard reset. [A] Hi, if you want to do hard reset, please follow steps at #option 2 above, that steps will do hard reset using hardware button combination key. [A] Hi, 3G and H is the same situations. It is depend on base station near your locations. So do not get confuse with 3G or HSDPA (H), they are some 3G. The information from this page describe about samsung s6312 hard reset,s6310 hard reset,samsung gt s6312 hard reset,s6312 hard reset,samsung gt-s6312 hard reset,hard reset samsung s6310,gt-s6312 hard reset,hard reset s6312,how to format samsung young,samsung s6312 hard reset code. If you need another resource for hard reset, use search function at this homepage or find from our related posts. How to Easily Master Format ACER LIQUID Z520 (DUO) with Safety Hard Reset? How to Safely Master Format SONY XPERIA ION (lt28h&LTE lt28i) with Easy Hard Reset? Hi, the default applications installed at internal memory, but some applications can be moved to external micro sdcard if the creator of that applications allow us to do that. Try to download applications from Google Play Store name : App to SD or AppMgr. You can see which applications that can be move to external sd card. as my phone was not accepting my gmail a/c password it was almost impossible.. but with your help of secret key*2767*3855#, my phone has been successfully formatted to factory data reset. hey please help me ! i got galaxy y gt-s6310 and it wont turn on , it just show me on screen ”samsung galaxy young Gt-S6310” and it just stay like that , i tryed the hard-reset but it doesn’t work ! Hi, in normal situations after doing hard reset the clean and factory default operating system will be reinstall to Samsung Galaxy Y, but if the hardware phone itself has got problem, then doing hard reset or reinstall the factory default operating system will not help. You can ask Samsung service center for further test your phone. Do you have any solution for these issues ? Hi, the first option that you can try is doing hard reset to clean all applications from Samsung Galaxy Y, after that please try to use it normally to see weather the problem still happen or not. But we suggest to not login first at beginning. Because some smartphone will restore back installed applications if you doing backup in Google server. So, after doing backup, please try to use several hours and do browsing or testing, also you need to test your phone call. If everything work okay after several hours, you can try to login again with Google account, so you can open Google Play Store and download some applications again. I have Samsung Galaxy Young S6312. I had purchased my Mobile 4 Months Back.. Since five days i find diffucult to use “Back” button (Feels like Touch is not working). Today in my mobile Both “Back” Button & “Options” button is not working at all..(These two Buttons are in left & Right side of Main Menu Button). Now my dout is by doing hard Reset will my problem solve or not. Is any risk that after Factory setting are restored, my phones works or not..
Kindly help to solve the problem,..
Hi, there are two possibility when your Back button can not work, first because applications problems which happen because we install one or more not compatible applications for Samsung Galaxy Young, or the second possibility is because the hardware problems. We suggest to do hard reset as first step to make sure where the problem come from. When your phone already hard reset, all setting and applications will be reset to factory default, so nothing will block your phone button from applications, but we suggest you to directly try or test your hardware button (BACK Button) after doing hard reset, please do not input any Google account, just to make sure everything work from beginning. Please backup all important data before doing hard reset, because all data will be removed or erase from your Samsung Galaxy Young. If after doing hard reset, the problem still happen, then this should be trouble from your Samsung Galaxy Young hardware, please bring it to nearest Samsung authorize service center to make sure with further test. Hi..I have a galaxy young..Gt 6310..it got discharged completly and after being fully charged its switching on and off by itself after a laps of 4 secs…please help..
Hi, you need to make sure your Samsung Galaxy Y battery still normal. Your phone will automatically OFF when the battery power is not enough. You also can try to charge your phone using other Android charger about 1 hours just to make sure your charger still work or not. If you battery does not have problem, then you have to do hard reset or master format with the steps option above. I have a GT-S3610T and when I turn the phone on, the Wi-Fi automatically turns on as well even though prior to turning the phone off, I turned off the Wi-Fi. When this happens, the amount of power in my battery drops as well. For example, before turning it off, my battery was at 75%. When I turn it on the next day, Wi-Fi turns back on and battery power drops to 65% or so. I already went into settings and checked the “Never” option in Keep Wi-Fi on during sleep mode. I also disabled “enable data access over mobile network”. So, I’m fresh out of ideas on else to do. Help is appreciated. Hi, it seems that you have already done the right thing to make sure the Wifi setting is not active from menu setting. However, we are suspect some applications that you have ever downloaded or installed before have options to automatically turning on the wifi setting for doing an action. Please make sure and find that trouble applications, otherwise you should have to do hard reset to reinstall the operating system and factory default applications. Hi, if you mean that you have already changed Google account password from computer browser, then you will be automatically ask for new password at your Samsung Galaxy Y when you access for Google Email or Google Play Store, as far as the account at your phone is the same with Google account that you have changed from computer. Hi ..i have samsung s6310. How to change in to 3g connction? I cant even dial #*#*4636*#*#.. in my phone plz tell me what to do to get 3g ..
Hi, please try to set the 3G Only at Setting > Mobile Network > Proffered network type. You also can download 3G/2G Only applications from Google Play Store, and let that applications work for 3G or 2G only as you choose from it. Hi admin,i have a rooted young gt s6312. I install cwm in my phone and take a backup. But, now phone is tourn off.when i press power botton, my phone is on and break the cwm home page. Again & again restore that but my phone is same possition. Now i ask,how can i flash when my phone is not workable and not run? Hi, unfortunately we can not give good solutions for problem which causes by non standard tweak at your Samsung Galaxy Y. although we can give some suggestion for reinstall new custom rom using ClockModWork, but you have to find good and recommended custom rom from your community that you follow for doing tweak or install recovery tools. However, we always do not recommended doing any custom tweak because some wrong steps can make our Samsung Galaxy Y become trouble. Hi all, need help, i restore my samsung 6310 a few days ago and the mobile data is not working anymore? Hi, we assume that you have already hard reset or restore to factory default your Samsung Galaxy Y, please try to use different simcard with Internet subscription. You also need to check APN at your menu Setting > Mobile Network > Access Poin Name, make sure the APN settings are right. Hi, if you have already done doing hard reset at your Samsung Galaxy Y to reformat to factory default, but the LCD touch screen still not work, then maybe your hardware get trouble. Please check it more at Samsung authorize service center. my phone is switch off , when i press the power bottom CWM(clockwork mod recovery) “s home page shown…i can’t boot my phone ..How can I fix it? please help me, please! please ! Hi, it seems that your Samsung Galaxy Y has already rooted or install with custom rom, therefore some strange problems can happen. But unfortunately we can not give good advice for your problems, because there are so many not standard possibilities that can make your phone get trouble. We only can give standard solutions to repair your problems. Thanks for your support.. my device will not start. i have done a hard reset. Hi, hard reset steps above will only work if your Samsung Galaxy Y still at standard rom and not get any custom tweak or not rooted. If you still not sure why your Samsung Galaxy Y still not start although you have done hard reset, then please try to consult with Samsung authorize service center. Hi, if you have trouble with wifi connection, please try to do hard reset with menu Setting at your Samsung Galaxy Young. It will reformat and restore back your operating system and setting conditions to factory default. If after doing hard reset your Wifi still not work, then maybe your hardware get trouble and need to get further check at Samsung authorize service center. How to hide the taskbar from the screen? Hi, it is depend on what kind of launcher that you use. If you use default home user interface, then you can not hide the taskbar from the screen of your Samsung Galaxy Y. Hey! my samsung galaxy young S6310 IS NOT WORKING. I pressed power button.it showed the samsung logo twice.but still it’s off..Idk whether there’s problem with lcd or battery.please suggest me. Hi, you need to bring your Samsung Galaxy Young to Samsung authorize service center for further check the LCD or battery. However, first you have to make sure your charger is fine by try use different Android charger which have minimum 1 A current output, if it still can not work then you can try to use hard reset steps at #option 2 above with combination button key. Hi, please try to go to menu Setting > Sound, and find vibration menu for your Samsung Galaxy Y. Suddenly my samsung galaxy s6312 phone got restarted and showing samsung page. Hi, please try to do hard reset using hardware button combination key steps at #option 2 above, it will reformat your Samsung Galaxy Y operating system to factory default. Hi, try to do hard reset your Samsung Galaxy Y using hardware button combination key. Please make sure your battery is not empty or do hard reset while power charger is plug. hi,please i have Samsung galaxy j1.there a password on it and I tried hard resetting it but the home key does not work. Do I have any alternative to reset my phone? Hi, we recommended to hard reset using steps at #option 2 above carefully. Some users have to do it several time until they get correct key press. Please do it again. You Samsung Galaxy Y may not work if you have flash with custom rom or done some other rooted tweak. Hi, you can try to boot your Samsung Galaxy Y to safe mode by turn off your phone, then continue press POWER button about 2 seconds and when you see Samsung Logo, press Volume down button. Hi, we are not sure about this problems. However, you may try to do hard reset using hardware button combination key to make your Samsung Galaxy Y restore back to factory default and can be use like new again. Hi, 3G and H is the same situations. It is depend on base station near your locations. So do not get confuse with 3G or HSDPA (H), they are some 3G. when i press the power button the screen hangs up to the logo samsung galaxy young GT-6312. I am unable to do soft reset or hard reset. Hi, if you want to do hard reset, please follow steps at #option 2 above, that steps will do hard reset using hardware button combination key.